A.B. 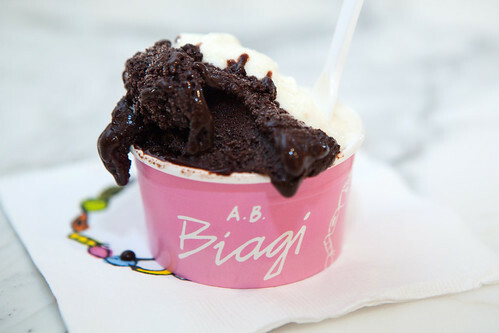 Biagi is a sunny yellow gelato shop in Nolita, by its proprietor, Antonio Barros Biagi. Antonio first fell in love with gelato while growing up with his Italian family in the Brazilian countryside. Italian immigrants adapted their gelato recipes to Brazil’s tropical weather, using local fruits and naturally lower fat milk to create lighter frozen desserts that could stand up to the heat. 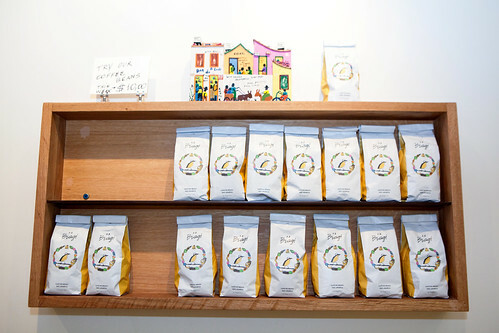 He spent seven years studying gelato, and now he has opened his own bright yellow shop in NoLita. He pasteurizes organic milk, uses sugar from his family’s mills in Brazil and lets the mixture mature for at least 24 hours so the base thickens naturally. 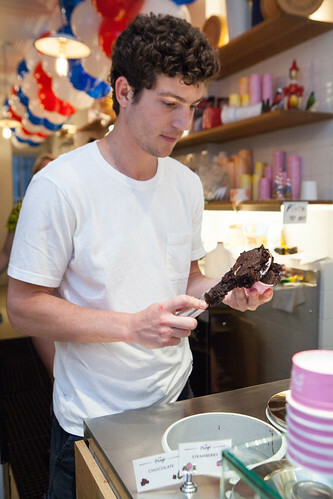 He then adds some exotic fruits like bergamot and açaí, nuts, chocolate, herbs and spices. The butterfat content of the final product is a mere 7 percent. 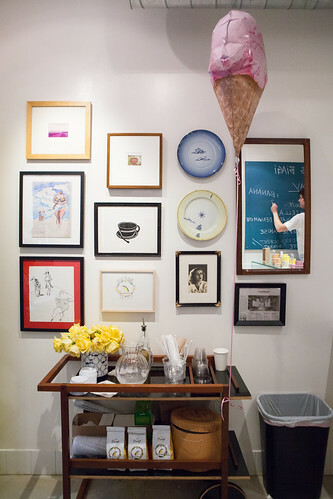 Cups of gelati and sorbetti! 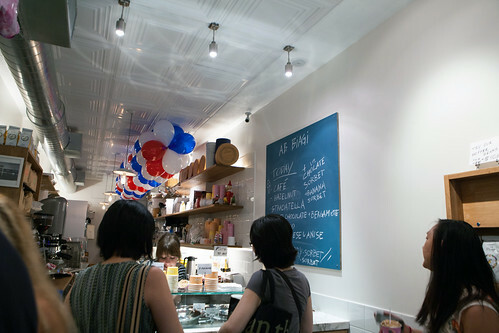 Of course, I adore gelato and sorbets so I’m pretty ecstatic to try out their stuff. 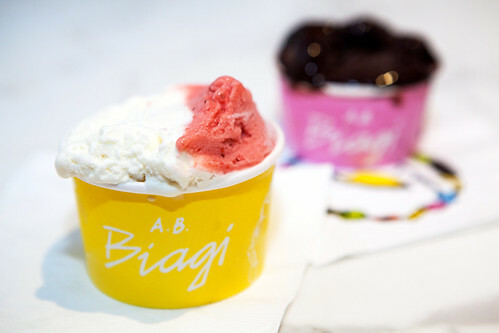 Cups of these gelati and sorbets range from $4.80 (a small cup) to $8.80 (large) and it’s worth every penny. All of these treats are robustly flavored of the said ingredient that it’s featuring (in other words, a hazelnut gelato does taste like that wonderful nut), smooth and creamy textured, and not too sweet. The chocolate sorbet is an intense, midnight dark, bitter chocolate that’s smooth and creamy almost like ice cream or gelato. The flavor I liked the most was the goat cheese and anise because it’s unique from others I’ve tried in the city; the flavors were balanced and I definitely tasted the slightly tart goat cheese initially and the anise as the finishing flavor. The white chocolate and bergamot was tasty combination of that citrus (it’s that prevalent citrus flavor you’d taste when you drink Earl Grey teas) and the sweet white chocolate. The strawberry sorbet tasted like concentrated, sweet ripe strawberries, as Antonio informed me that it’s 40 percent fruit used in that base. 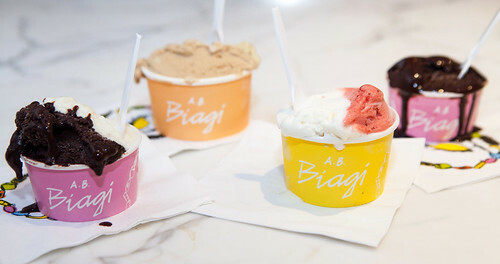 If you are around the area and want to have something to cool you off and satisfy your sweet tooth after all of the shopping, I highly recommend you to have a cup or a cone of A.B. 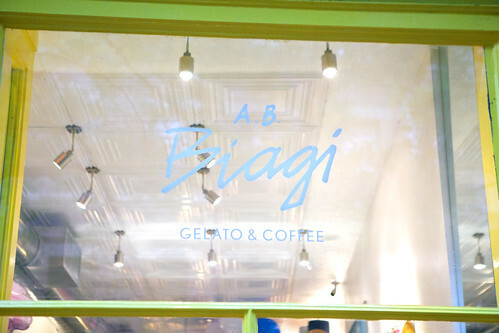 Biagi’s gelati and sorbets.